The empowerment is on Monday, August 12 at 7 pm and the short teaching is on Tuesday, August 13 at 7 pm. SEE THIS PAGE ABOVE and follow the links. PREREQUISITE: Prior Hevajra or Cakrasamvara empowerment from a Sakya lama (no exception to this). The location is Ewam Choden. 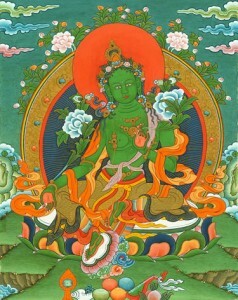 Her Eminence Jetsun Kushok Chime Luding will kindly offer a blessing empowerment of the Green Tara. Bodhisattva Green Tara (Jetsun Drolma) protects, heals, and promotes long-life. This event is open to everyone, and it is especially for Tibetans. DATE and TIME-—Saturday, August 10, at 2:00 p.m. REQUESTED DONATION—$20.00 (Dana to the Lama is separate.) There is no pre-registration for this event.